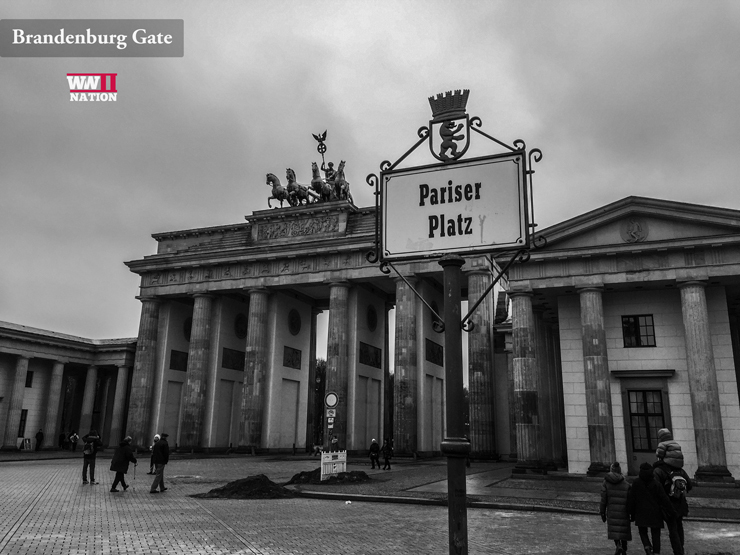 As I am sure you are all well and truly aware by now, we recently visited Germany to explore Berlin and learn a little more about Hitler’s former capital and the history that still remains today as a reminder of the Third Reich. I thought I would put together a selection of photos from the trip showing some of the highlights, including a little bit of information and history from the research we did. 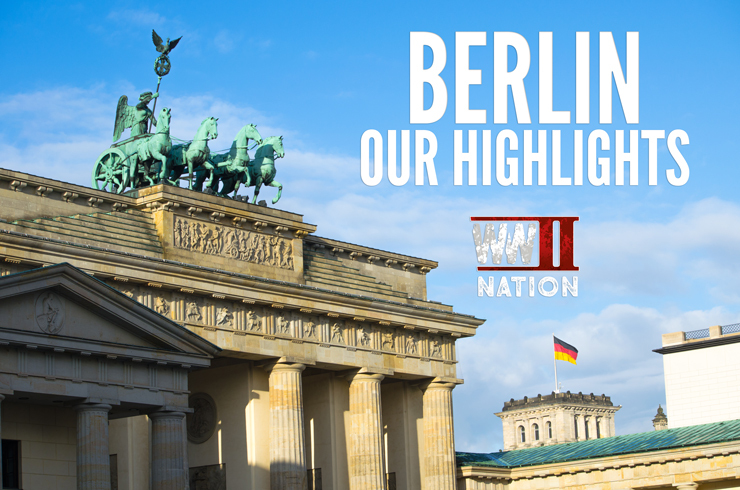 Following the filming of our opening time-lapse of the magnificent Brandenburg Gate, we ventured over to the Reichstag building, inspecting its pock-marked exterior which still shows many of the scars from that final battle for Berlin in April-May 1945. Opened in 1894 after 10 years of construction, the Reichstag was burnt down in February 1933, which the NSDAP used as a pretext to assert control and diminish certain liberties. Under the Third Reich the building was not used nor restored, its only use came during the final Battle of Berlin in April-May 1945. Seen as the ultimate prize by Stalin it was one of his main targets and ordered his Marshals to capture it and hoist the Red Flag from its roof in time for the May Day celebrations. Consequently it was heavily damaged in the bitter fighting for the building with the Russians making repeated attempts to storm the well-entranched garrison that was defended by a mixed group of around a thousand men. 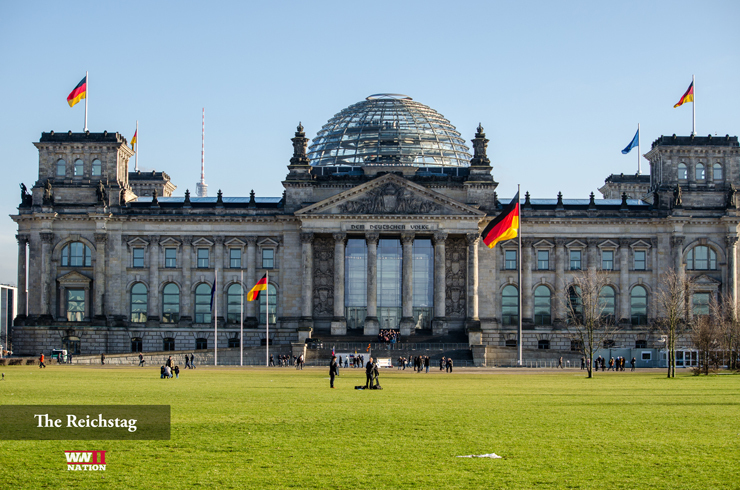 With the onset of the Cold War in the immediate aftermath of the Second World War, the Reichstag that we see today was not actually restored until the 1990s. 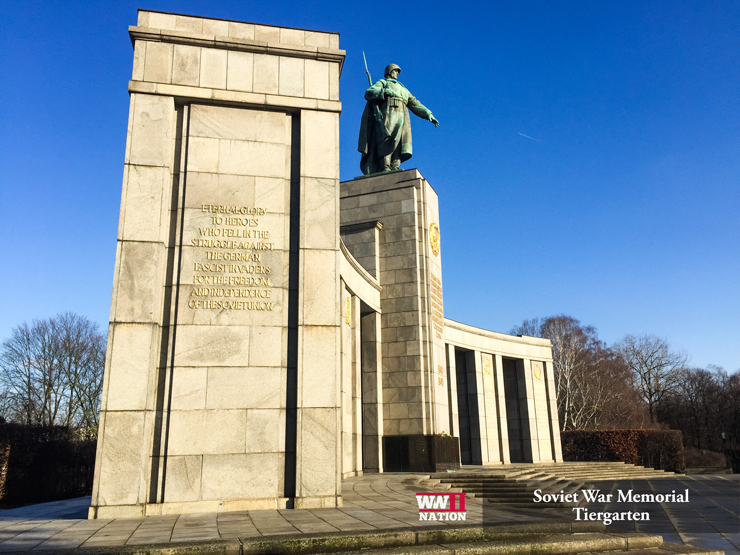 From here we ventured into the beautifully serene setting of the Berlin Tiergarten and visited the Soviet War Memorial. Built in the immediate aftermath of the war on the intended meeting point of the two axis of Speer and Hitler’s planned Germania. Constructed with granite slabs taken from Hitler’s New Reich Chancellery building, it was completed on 11 November 1945 with over 2000 Soviet soldiers buried here who were killed in the fighting to take the Reichstag. Certainly one of the highlights for me, was getting to visit the last standing (well half-standing) flak tower in Berlin at Humboldthain. It was one of six Flakturme commissioned by Hitler in September 1940 to try and help counter the threat to the city from the British aerial bombardment. Only 3 were actually built and completed in Berlin during the Second World War, one at Humboldthain, one at Zoo and one at Friedrichshain. These colossal structures could house around 15,000 people during air raids, there was also a command bunker further down which could usually help shield an additional number of civilians. 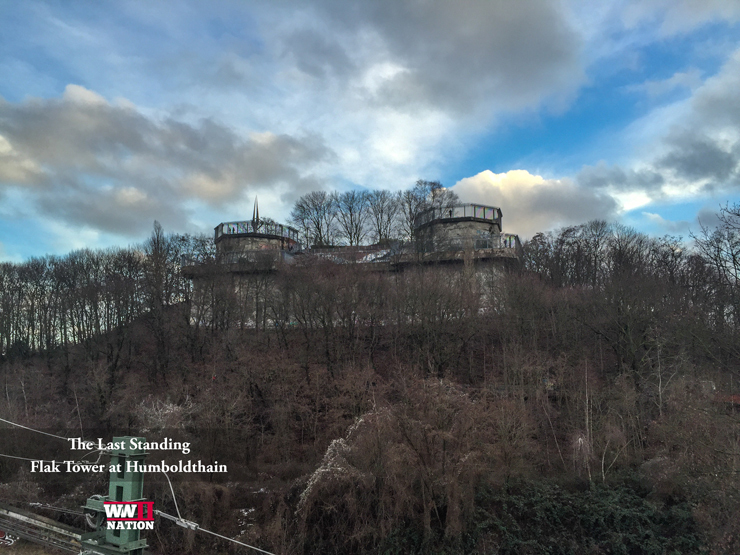 After the war, the Flak Towers were demilitarised, at Humboldthain the south side and the command bunker were blown up by French pioneers. 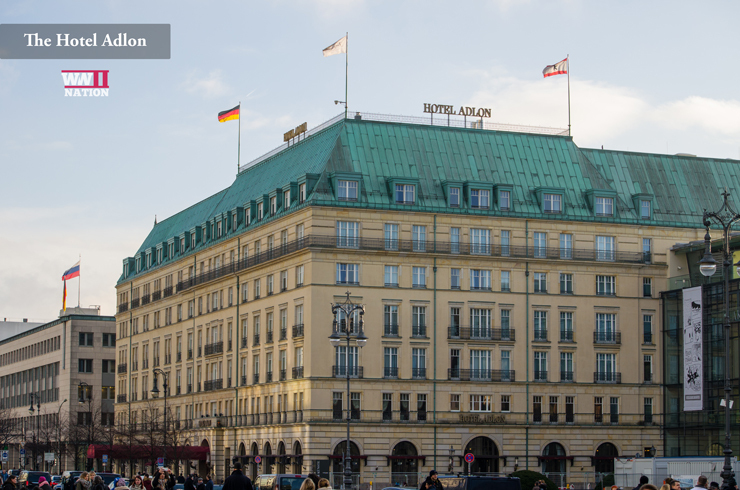 The famous and luxurious Hotel Adlon pictured here is not the original, the building was completely destroyed at the end of the Second World War, Soviet soldiers drunkenly burnt down the Hotel having raided the wine-cellars looking for alcohol. Since rebuilt, the original had been used by Evan Braun and her sister for a short while during the war, it had had an underground air-raid bunker added to protect its guests from the growing threat faced by the Allied bombing offensive and was also used a military hospital towards the end during the final battle for Berlin. 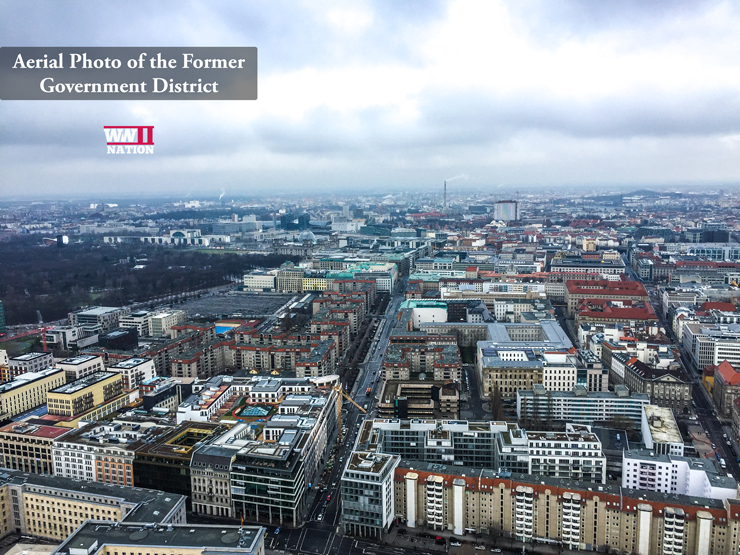 Looking straight down Wilhelmstrasse, this aerial photograph shows how Hitler’s former government district appears today. To provide you with an indication of the sheer-scale of the New Reich Chancellery that was demolished at the end of the Second World War, you can see to the left the Soviet grey/red high-rise flats that were built on the cleared site. Behind this is the more recent Holocaust memorial which is where the Chancellery gardens would have been. Also the remnants of Joseph Goebbels former Ministry of Propaganda and Popular Enlightenment can just be made out on the right of the photograph, the 5th row of buildings back with a silvery-grey roof that forms a type of ‘P’ shape. 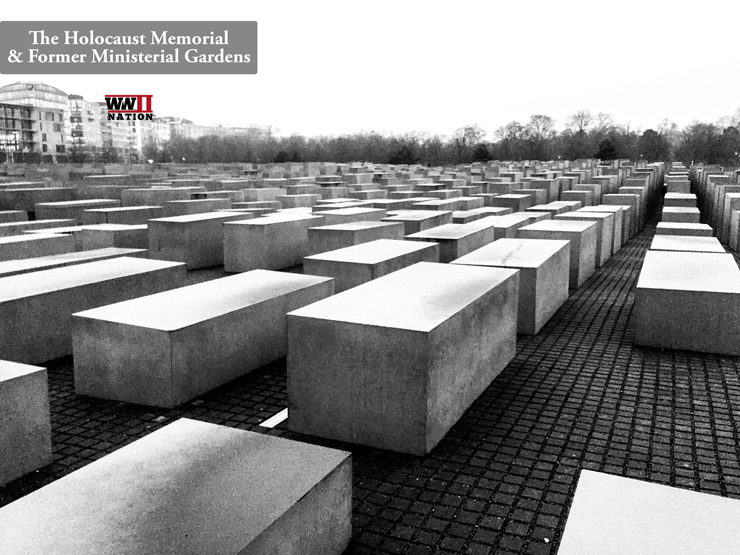 In the very heart of Berlin beyond the Brandenburg Gate, opposite the American Embassy and Tiergarten stands the memorial dedicated to the Jews murdered during the Holocaust. Built in 2005 on the site of the former ministerial gardens, over 2700 concrete blocks makes up this moving tribute. Interestingly when the site was excavated in preparation for the memorials construction, the private bunker of Joseph Goebbels was discovered, and is today sealed and buried beneath the memorial. 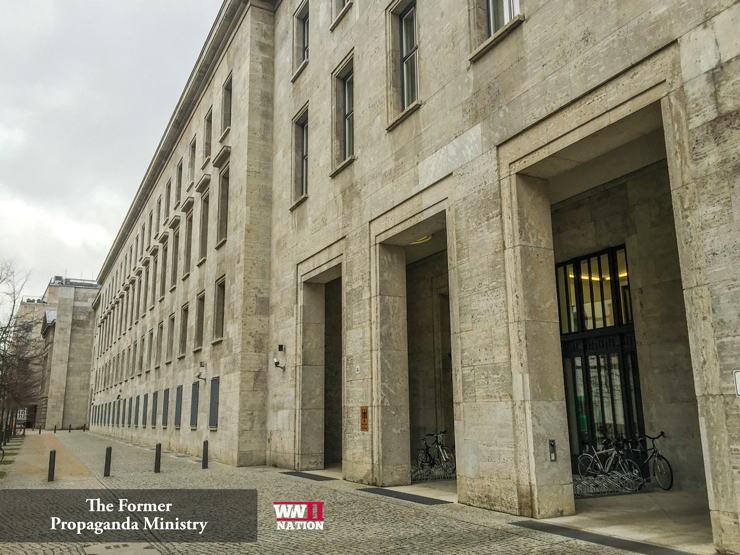 We also spent a morning at the Bendlerblock and former Reich War Ministry visiting the Resistance Museum and Claus von Stauffenberg’s office (from June-July 1944). Stauffenberg was Chief of Staff to the Commanding Officer of the Reserve Army and was one of the chief architects behind Operation Valkyrie, the attempt on Hitler’s life on 20th July 1944. 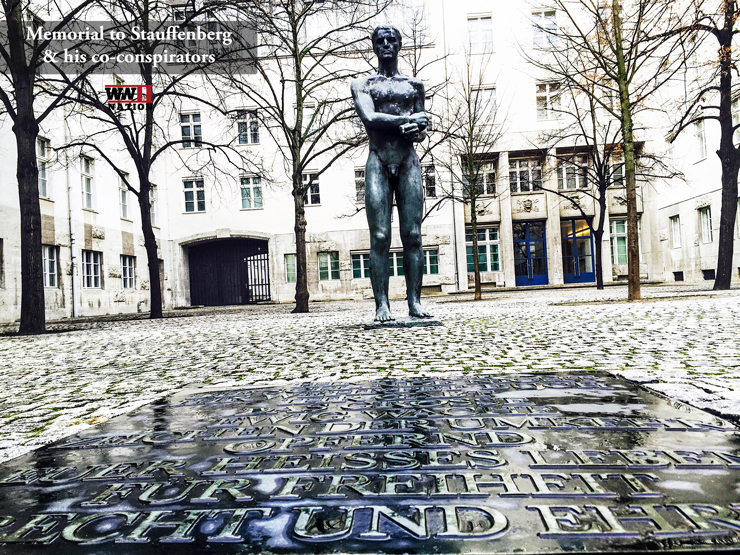 Today outside in the courtyard of remembrance, this memorial (photographed above) marks the spot where Stauffenberg and a few of his fellow co-conspirators were shot in the hours following the failed coup attempt. 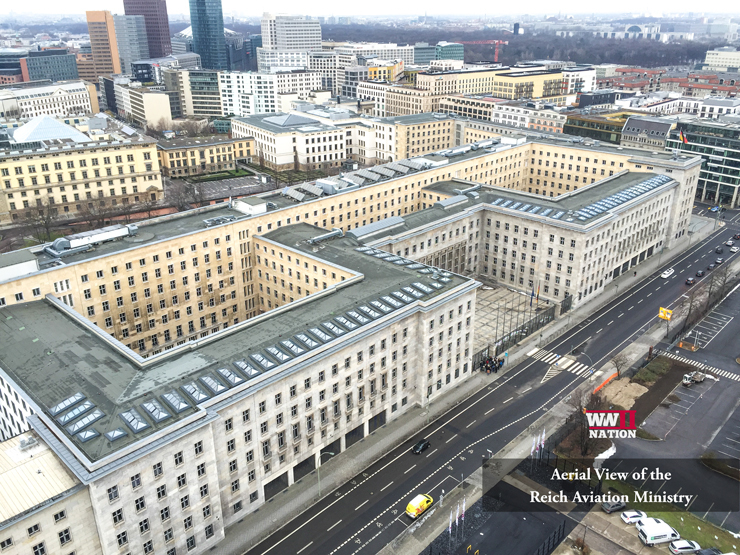 Stretching over 250 metres along Wilhelmstrasse, this colossal building which is today home to the German Federal Ministry of Finance, was built in the 1930s and was one of the first major building projects during the Nazi Party’s reign. 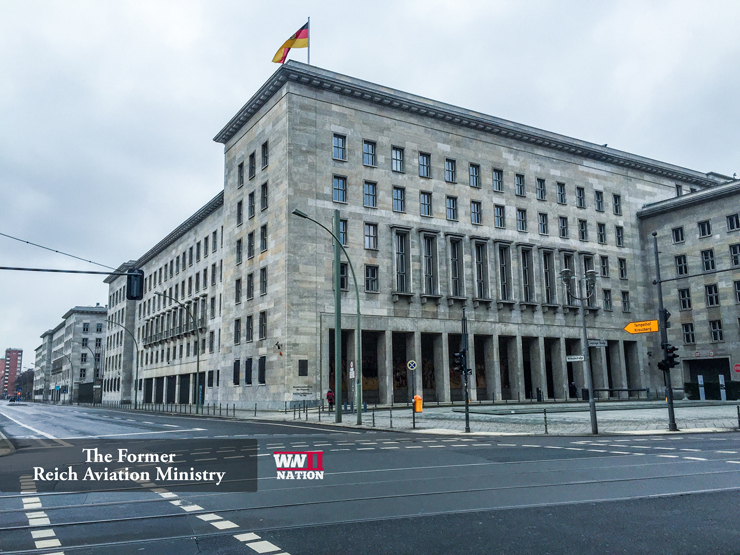 Designed by architect Ernst Segebiel, the Reich Aviation Ministry was completed in 1936 after two years of construction and housed Göring’s Luftwaffe administration. The Aviation Ministry’s banisters were made of aircraft aluminium and the foyer lighting was modelled on Anti-Aircraft searchlights. With over 2000 rooms, 4000 windows and several kms of corridors it was one of the largest office buildings in Europe. And remarkably given the intensity of the Allied bombing of Berlin and giving its sheer scale, the building survived, apparently being hit only once. The Ministry of Public Enlightenment and Propaganda, established in March 1933 with Joseph Goebbels as its head was housed in the 18th century former governmental press office situated opposite the future site of the New Reich Chancellery. The building was later extended as the Ministry grew and it is this extension that is the only part that still survives, the rest was destroyed in 1945 by Allied air raids. 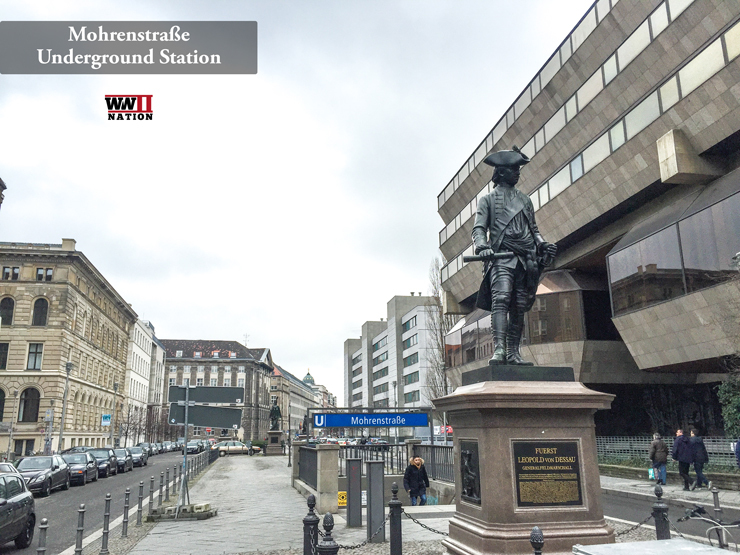 Positioned opposite the New Reich Chancellery building, this underground station was originally called the Kaiserhof after the famous Hotel located nearby. Badly damaged during the Battle for Berlin it was rebuilt and renamed after the war. There were suggestions that marble from Hitler’s Chancellery was used as part of the U-Bahn station’s reconstruction, however as Paul Reed recently mentioned in our interview, new research suggests that this may well not be the case. Interestingly it was from here that on 1st May 1945, a number of groups attempted to flee and breakout from the Chancellery bunkers. We also ventured slightly further out of the city centre to explore one of Berlin’s oldest cemeteries, the Invalidenfriedhof which was established around the time of Frederick the Great. There are a number of Second World War related notables buried here, the likes of Fritz Todt, Ernst Udet, Rudolf Schmundt and Reinhard Heydrich. Almost 3000 civilians killed during the Allied bombing raids on Berlin are also buried here. 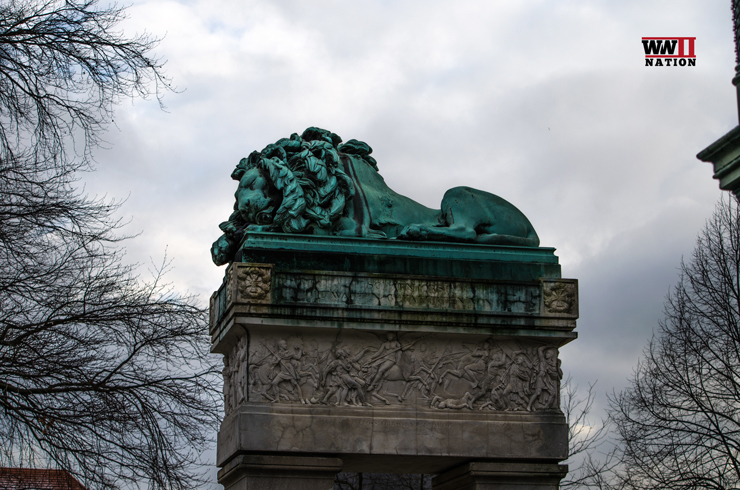 The Sleeping Lion tomb (photographed above) is the resting place of General Gerhard von Scharnhorst a hero from the Napoleonic Wars. The Lion was designed by Friedrich Schinkel who also designed the iconic Iron Cross medal (fact courtesy of historian Rob Schaefer). Interestingly First World War German fighter ace, Manfred von Richthofen, nicknamed the Red Baron was also originally buried here (the marker for which is still there) but in 1975 his remains were moved to Wiesbaden Sudfriedhof. Walking around Berlin there are still numerous reminders of the bitter fighting that took place here over 70 years ago. 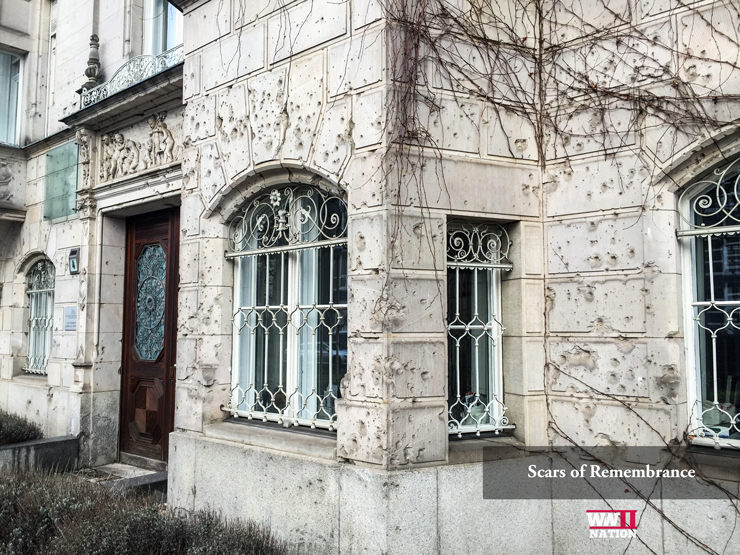 For example Villa Parey located on Sigismundstrasse (photographed above) is heavily pockmarked with battle damage. The Villa was built in 1896 and was eventually brought from the Parey family by the OKH in 1938 and used by them until 1945. 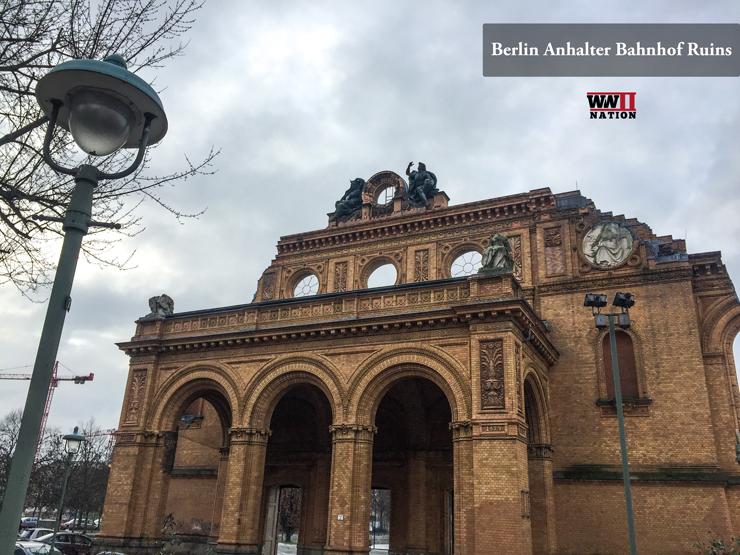 Once one of the largest railway stations in Europe, the Anhalter was mostly destroyed in an Allied bombing raid on 03rd February 1945. Anhalter Station certainly had a more sinister side was one of three train stations used by the NSDAP in its deportations of Berlin’s jewish community. A total of 116 convoys left from here, taking over 9600 people were deported from this station alone. Over 68,000 tonnes of Allied bombs dropped down on Berlin during the Second World War. 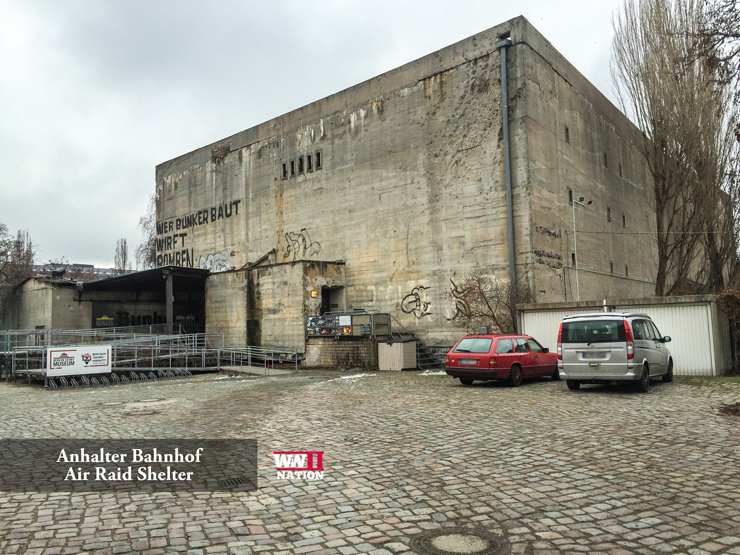 Located next to the Anhalter Bahnhof, this air raid shelter designed to protect the local civilians and train workers was one of the largest shelters in Berlin and could hold around 12,000 people. I hope you enjoyed reading this blog post. Ross and I both had a really enjoyable trip and cannot wait to venture back out there again at some point soon to discover even more about the history behind this incredible city.